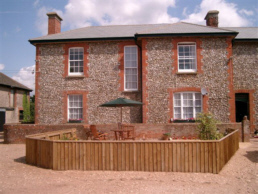 Lower Pinn is a working farm of over 220 acres offering Farmhouse Bed and Breakfast in a relaxed and friendly atmosphere. I have three comfortable guest rooms,2 rooms have zip & link beds can be twin or super king size the other room has a king size double bed , all with en suite facilities with large showers, wash basin and toilet The bedrooms are equipped for making hot drinks and come with remote control colour television, clock radio,shaver points, hair dryer, and central heating throughout. A fridge is provided for the use of guests and has fresh milk in for your hot drinks. Start your day with a delicious breakfast served in the Dining room using local produce when ever possible. Guests have their own keys and may return at any time throughout the day. There is ample off-road parking. Sit on our new patio and watch the Swallows swoop in and out of the barns. Walk across the fields and see the birds of prey with unsurpassed views along the coast and inland to Dartmoor. Lower Pinn is situated two miles to the West of the unspoilt seaside resort of Sidmouth and one mile to the east of the pretty village of Otterton, officially deemed as outstanding for its traditional Devon beauty. If you enjoy walking there are many coastal and countryside walks, with our fields extending to the South West coastal path. 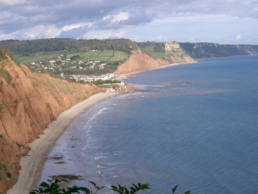 The resorts of Sidmouth, Beer, Branscome, Seaton, Lyme Regis, Budliegh Salterton and Exmouth are nearby, as are many good inns and restaurants for evening meals.